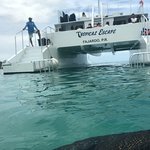 Tour includes catamaran day trip only. 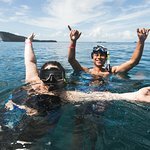 Book this package that makes it a breeze to cruise to Culebra from Fajardo for a day of snorkeling, swimming, and beach-hopping. It includes transportation from your hotel plus a buffet lunch and free-flowing tropical drinks. Grab a rum punch or piña colada from the bar on the high-speed catamaran, slip into the water to snorkel off Culebra’s coast, and then visit Flamenco or Culebrita Beach for a full day of relaxed exploring and a great introduction to Puerto Rico’s less developed side. Meet a driver at your hotel or make your way to Fajardo’s Puerto del Rey to board a high-speed catamaran for the crossing to Culebra. Find a comfortable place to relax on deck during the 50-minute cruise, sipping a drink from the bar as you enjoy great views of the Cordillera islands. The day’s first destination is a 1.5-hour stop at either Carlos Rosario or the Luis Peña underwater nature preserve, where you can grab snorkeling equipment to check out a beautiful reef. After working up an appetite in the water, return to the boat for a buffet lunch that includes fresh fruit, pasta salad, seafood or chicken salad, coleslaw or bean salad, fresh bread, sliced meats, cheeses, chips, and cookies. 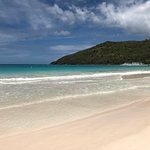 From there, continue to a Culebra beach, either Flamenco or the beach on tiny Culebrita, with the afternoon to swim, snorkel, and sunbathe before returning to Fajardo. The crew was nice. When we went to our second destination, it took about 45 minutes to get the boat in a location. We saw other boats docked more quickly. So, that was frustrating, but aside from that, it was a nice trip. Definitely have to try it out if you’re visiting Puerto Rico. Staff was very friendly and it was a great time. Get quick answers from Culebra Day Trip by Catamaran from Fajardo staff and past visitors. Why is the charge with transportation when I dont need transportation? I found a price that was a little cheaper with no transportation. We drove ourselves.